Colombo isn't a vintner's destination, so all we have is a selection of imported wines. That, and a lack of casual wine-drinking culture means we haven't seen too many extensive wine cellars here, but the few that exist aren't too shabby. Most restaurants tout low-to-mid range staples from Australia or South Africa like Tall Horse, Pearly Bay and Banrock Station, but there are a few that are commendable in their range. Consult your nearest sommelier, or download the super useful Vivino app, and get tasting. Barefoot, apart from being one of Colombo's most laidback watering holes for expats and tourists, also boasts a pretty impressive selection of wine. Their mark up is very reasonable too, especially since all of their brands are meant for affordable, casual drinks. Keep an eye out for their little blackboard, which will let you know if there's anything going in their wine bin - a selection of discounted bottles. Apart from Wednesday quiz nights, the Cafe closes around sunset so if al fresco day drinking is your thing, hurry over. Good old Bayleaf, Colombo 7's staple Italian joint, has a pretty vast wine list to indulge in. Despite the cuisine at hand, they've got a solid selection of wine from various terroirs, including a couple of reasonable French varieties. However, bewarned that you won't be spending less than around Rs. 4000 a bottle, and those taxes really add up. The Park Street Mews' bright purple bar, Curve generally has some stellar live music and a lively crowd spilling out onto the cobblestoned streets. Ensconced inside is a little private wine cellar, that you can sit in if you're a regular or, you know, actually drinking wine. We haven't really gotten into their wine list yet, but it seems to be pretty large, so it slips onto our list. We also love the al fresco seating, which gives off a sultry 'ltalian piazza in the summer' vibe. Café Français is still a fresh face in comparison to most places on this list. They've also got one of the most extensive wine lists we've seen with the city, with a solid selection of French champagnes and bubblys to boot. You won't find your Tall Horses poking their noses in here though. The starting bottle of rosé, a domain Bachellery is about Rs. 4000, which means that there aren't really any entry-level wines on offer (perhaps a good thing?). It's a well-curated selection in chic surroundings, which makes CF one of our go-to spots for a weekend bottle of wine. Featuring some of the most inventive menus in town, rare is one of Colombo's dining darlings. They also have a full wine cellar wall on display near their private dining area, a light hat tip to their extensive collection. Despite their slight foray into fine dining, the wines on offer aren't as expensive as you'd imagine. You'd be able to get a basic bottle to pair your meal with for around Rs. 3000. 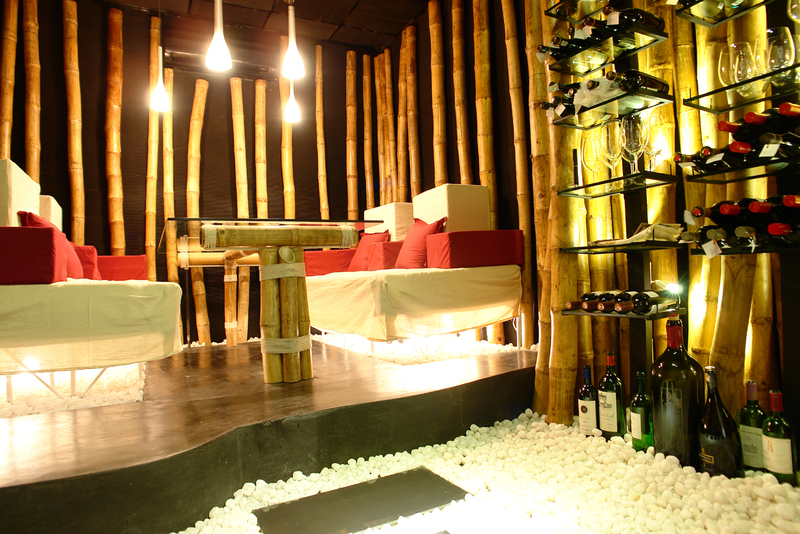 Sugar 41 offers some of the best selections of wine in Colombo. With a fully stocked wine cellar that isn't just there for decor, you can treat yourself to a nice bottle of bubbly (we tried a lovely Spanish cava this weekend for just Rs. 5000) or an entry level mixed vintage for about Rs. 3500. Given the bar's chill and upscale vibe, along with its fabulous South African live band, this is probably one of the nicest spots to relax with a bottle of wine. We don't recommend late night weekends though, as the service drops considerably. Arguably one of the most expensive spots on this list, London Grill has a huge spread of wines, as you'd expect. Again, we haven't tested it out too much (no money no honey), but if you can afford it, go wild. Sugar Bistro pleasantly surprises us for a couple of reasons - firstly because it's managed to remain popular over the years (commendable for Colombo's fickle restaurant scene), and secondly for the level of quality they maintain despite relatively reasonable prices. Their selection of wine isn't extensive, but the prices make the visit well worth it. They also do a great daily happy hour which gives you a bottle free for each one that you drink on a couple of options. Sure, they're not high-end wines, but by the second one who's judging? Qbaa has sort of slipped off the radar recently, but from what we remember. they have a pretty large and well-curated wine menu. We'd also attended a couple of Trekurious' wine pairing dinners there, which cemented that impression. Qbaa tends to get pretty crowded on weekends though, so a weekday tipple in their well air-conditioned brick-walled cellar is recommended. Nihonbashi's flagship branch on Galle Face Terrace plays host to an impressive selection of vintages. Apart from a well-rounded and multi-terroir wine list, they also have a dedicated private dining room called the wine room, which can serve up to 4 people within a beautiful, fully stocked wine room. The Cloud Cafe has also made it onto this list by virtue of their great happy hour, offering a solid 50% off on various wines. They also do a good curation of "wines of the month" at a reasonable rate. While we enjoy the ambience, we find the Courtyard's spots a bit pricey when there isn't a deal on. On Asia's Top 50 Restaurants List along with its partner Nihonbashi, MoC's wine list is as extensive as you'd expect. Much like their crab, you can expect high quality and prices to match. Their attention to detail is great though, and we like that they allow their reds to breathe in funky blown glass decanters. Personally, I'd recommend a nice Riesling to complement the inherent richness of crab meat and MoC's buttery garlic sauce, but the staff is usually happy to help you pair too. YUMI is up there with Colombo's top fine dining restaurants. Despite a slightly graceless feel to it, it features a solid wine list, as portrayed by their impressive display sculpture outside the restaurant. Brace yourself for hefty mark-ups (as is to be expected from any 5 star restaurant), and equally impressive variety of wine, champagne, and sake. Okay, so Cinnamon Red's rooftop bar doesn't have the most amazing of wine lists, but it's a full page or so of solid options. We've got fairly good bottles of prosecco there for about Rs. 3500 in the past. Furthermore, their mark up isn't exorbitant, and their view is possibly the best in the city. Pair your bottle of bubbly with a sunset over Colombo for the full city experience. In addition to the places listed, there are several restaurants that are BYOB. You can pick out a good bottle at House of Wines or Victoria Wines and swing by.